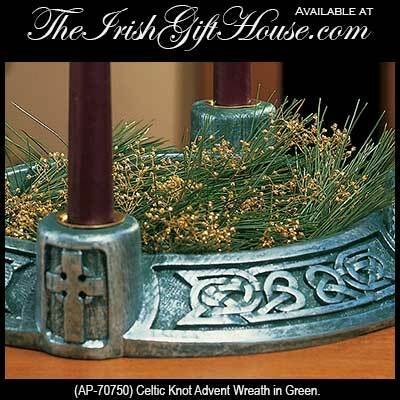 Irish Christmas Celtic Knot Advent Wreath in Green. Sorry, this Irish advent wreath is now sold out for the season. 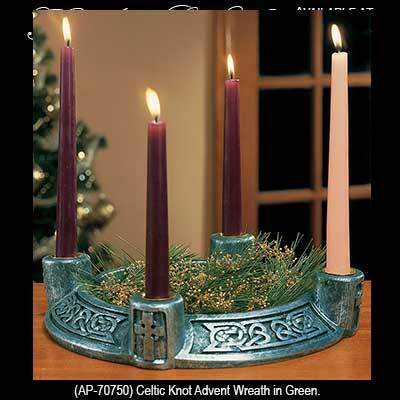 Irish Christmas Celtic Knot Advent Wreath with a Celtic Cross at each candle holder. The unending Celtic knotwork motif symbolizes eternity. Made of green color resin, with brass-colored candle cups. Felt pads on bottom. Ceremony pamphlet included. Wreath measures 12.75" diameter; 10" candles included. Boxed with the the Celtic Knot History card.